Coloured Raine Matte Lip Paint in Frances, Fame, 24Seven, Speechless, & Galaxy. 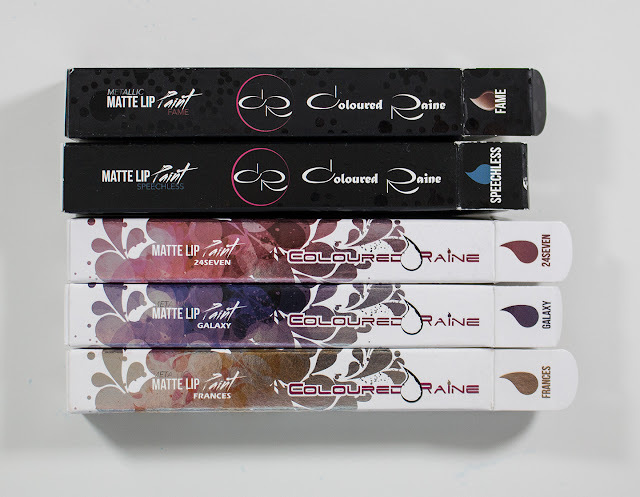 The Coloured Raine Matte Lip Paint lipsticks retail for $17US for 0.14oz/4g/4mL of product each. Coloured Raine Matte Lip Paint in Galaxy & Speechless. 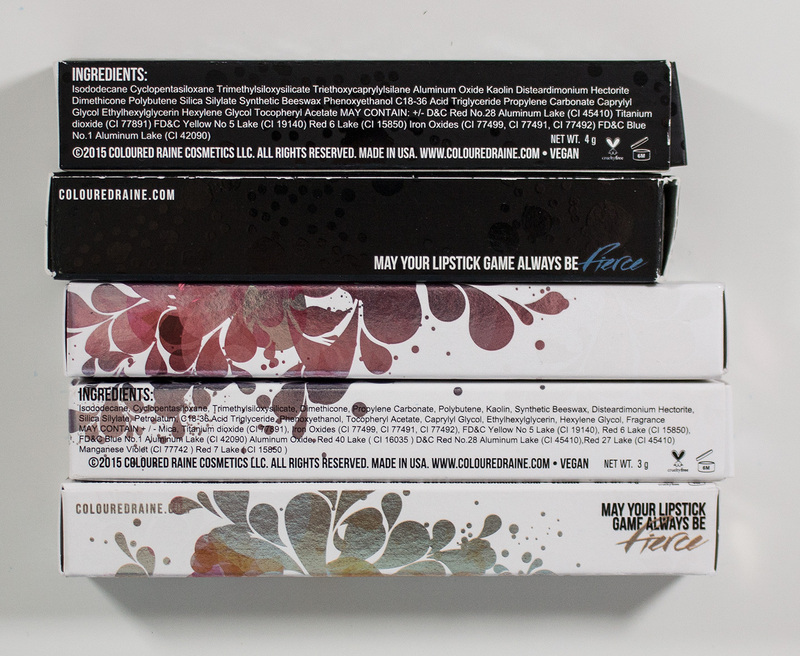 Coloured Raine Matte Lip Paint in Fame, and Speechless(Original box art) and 24Seven, Galaxy & Frances (New box art colour coded to shades). 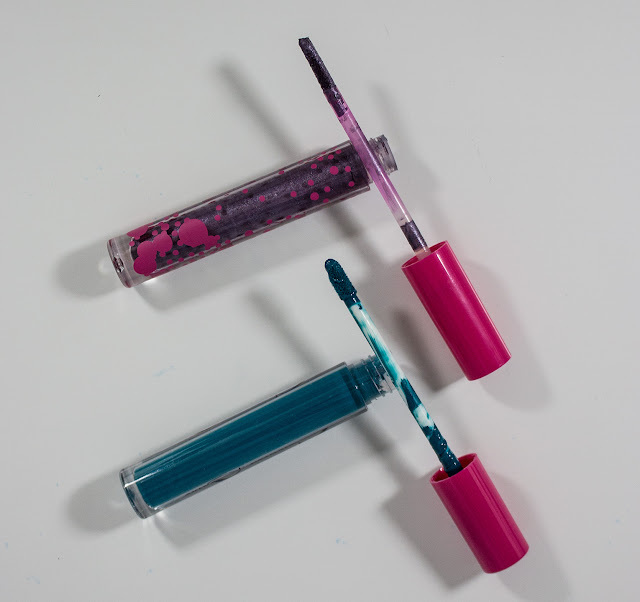 The Matte Lip Paint formula is thin in texture with full pigmentations on the lips. Some of the shades I missed gaps in my lip swatches because I didn't feel the need to apply a second layer at a normal viewing in a mirror. 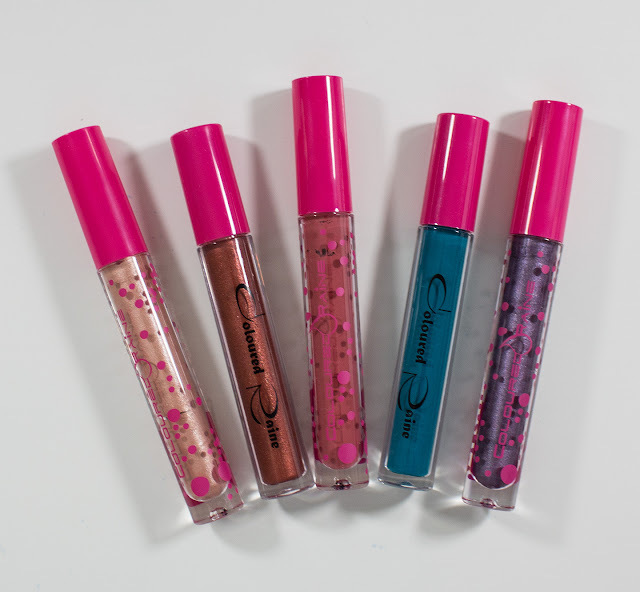 I can feel all the shades on the lips while wearing them and although it's not drying, my lips feel dry while wearing them. Some of the shade does flake from the centre but after 8 hours wear without eating anything oily but in really tiny pieces from the edge but nothing you can't fix. I found touching up the shades works ok with little build up on the lips. Frances is warm champagne with a shimmer finish. Fame is a deep copper with a shimmer finish. 24Seven is a dusty rose with a matte finish. Speechless is a vibrant teal with a matte finish. Galaxy is a dusty purple with a shimmer finish. Wear: For the Matte Lip Paint I get about 7-9 hours. 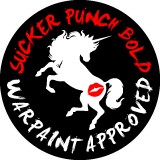 They also wear down with dignity and these fade from the inside of the lip out. 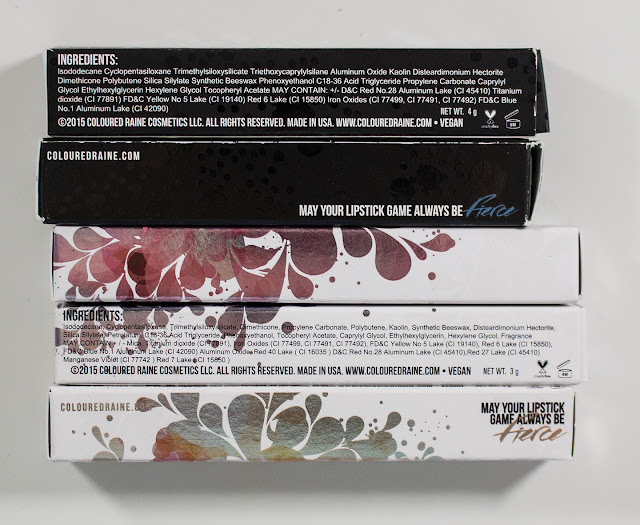 Packaging: Is a clear frosted tube with a teardrop-shaped applicator with a divet in the middle to grab more product. The new full-size packaging feels slightly lighter than the older ones I have. 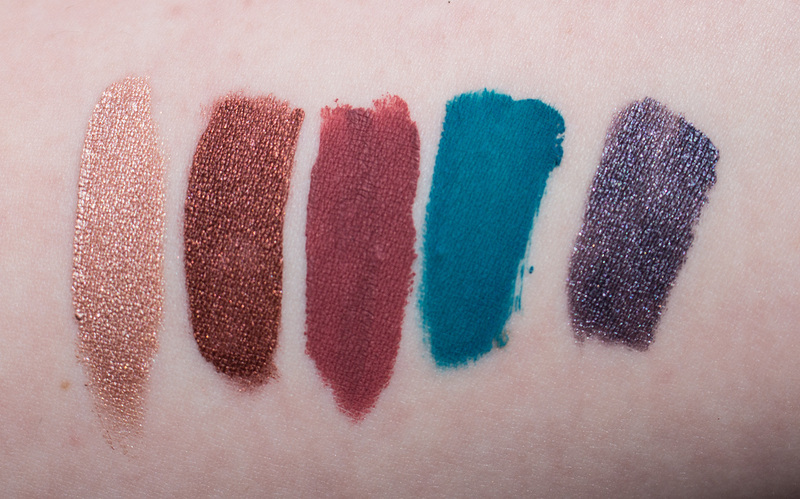 Daylight swatches: Coloured Raine Matte Lip Paint in Frances, Fame, 24Seven, Speechless, & Galaxy. 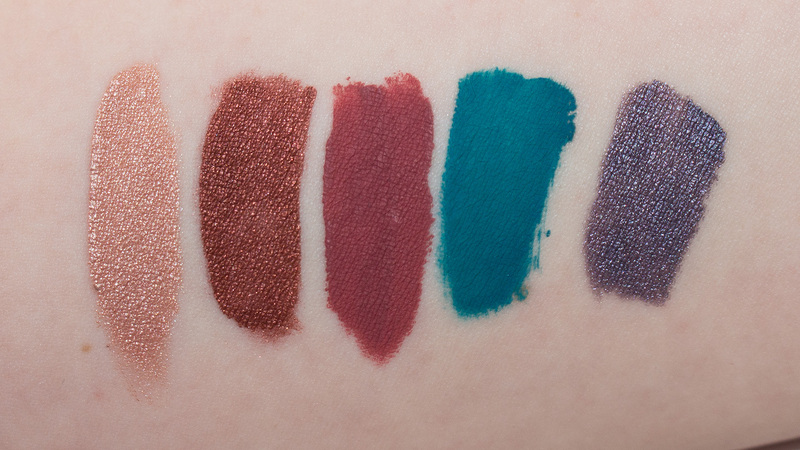 Flash swatches: Coloured Raine Matte Lip Paint in Frances, Fame, 24Seven, Speechless, & Galaxy. Fame with Frances on top. I really do like the Coloured Raine Matte Lip Paint formula so I got more of them. It's not my favourite for mattes because of the dry feeling on the lips, but these wear longer than most of my softer feel liquid lipsticks. The metallic shades and formula are excellent.